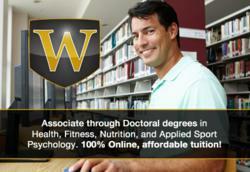 Wexford University offers flexible online classes for students in its bachelor’s in health and fitness degree program. The online degree prepares U.S. and international students for careers in health, fitness and wellness. Earning your health and fitness degree gives you the knowledge to start a career in over 50 different health and fitness niche markets. Since most people lose sight of their New Year’s resolutions after 90 days or less, summer offers a great chance to take stock and get back on track. Students interested in pursuing higher education on their own schedule have a great option for meeting their goals and changing their lives: Wexford University’s online bachelor’s degree in health and fitness. The health and fitness degree program prepares students for careers as an exercise scientist, kinesiologist, health educator, clinical exercise physiologist, corporate wellness director and physical therapy as well as further higher education in health and wellness. Interested students can learn more and apply online now for summer classes, which begin June 24, at http://wexford.edu/degree-programs/bachelor-of-science-degree-in-health-and-fitness/. Students can learn more about the online health and fitness program and apply for the summer session now at http://wexford.edu/apply/.